Your skin is the first line of defense your body has so taking care of it is important not just for appearance, but for your overall health. That may sound a little dramatic, but it’s true. Proper skin care helps to keep our outermost surface layer of skin intact. This layer maintains skin's overall hydration and serves as our primary defense against the environment, so keeping it strong and healthy is critical. Harsh cleansers can damage the outer layer by stripping essential lipids and moisture. Using a proper skin care regimen daily can help preserve this important protective layer. No matter what your skin type, you will need to wash your face in the morning and before bed. Since the skin loses its natural oils when it is overwashed, it’s best to keep extra cleansings to a minimum. Steer clear of bar soaps as they can be harsh and drying to the skin. Use a cleanser specifically formulated for the face. Look for products that are specifically designed for your skin type and then experiment to find the one that works best for you. Often times products will be labeled according to the special skin type or skin need that it addresses. Theraderm Cleansing Wash is soap-free, oil-free and fragrance-free making it perfect for all skin types. It is gentle enough for twice daily use, yet effective enough to remove even the most stubborn makeup, oils and cellular debris from your skin. As we age, our cellular turnover slows down significantly. This means exfoliation is one of the most important steps to keep skin from appearing dull and dry. There are few things you should know about exfoliation -- don’t use anything that is gritty as it may cause more damage than good. Using an alpha hydroxy acid-based product, such as Theraderm Fruit Acid Exfoliant, is a great way to bring the healthy glow back to skin. However - there is more to exfoliation than a healthy glow. Keeping dead cells off the surface of your skin also allows any subsequent products to penetrate more deeply and more evenly. This means any corrective or reparative serums, moisturizers or targeted, anti-aging products will be considerably more effective. In order to fight damaging free radicals, our skin needs antioxidants. Not only do antioxidants render free radicals useless, they also help prevent UV damage from the sun. Theraderm OPC Reparative Serum contains oligomeric proanthocyanidins that are 20 times more powerful than Vitamin C and 50 times more powerful than Vitamin E as a free radical scavenger. It is also lightweight making it perfect for all skin types. This is where a lot of people get lost when it comes to a skin care routine. It doesn’t matter what type of skin you have, you need a moisturizer. Obviously, oily skin has completely different needs than dry skin does, but allowing oily skin to “dry out” only results in increased oil production making oilier than it needs to be. You could choose Theraderm Peptide Hydrator or OPC Reparative Serum. Peptide Hydrator is a lightweight cream that contains a patented, healing peptide - Soluble Keratin Peptide. Before you start searching for products with this little jewel -- it is exclusively available in Theraderm Clinical Skin Care products! OPC Reparative Serum contains hyaluronic acid that attracts 1,000 times its weight in water making it an excellent hydrator for very oily skin.The antioxidant properties are also very soothing and help calm any redness that may be present. Theraderm Peptide Hydrator also works for combination/normal skin as it doesn’t clog pores in the oilier t-zone, but fully hydrates the drier areas. You know you have dry skin if your skin feels tight and dehydrated. It also tends to absorb moisturizer like a sponge. If you have dry skin you need to look for a moisturizer with an emollient that will help preserve the lipid barrier that keeps hydration where it can work best. Lanolin in Theraderm Enriched Facial Moisturizer does this and works without clogging pores. We couldn’t forget those with sensitive/acne prone skin. This type of skin is characterized by extreme sensitivity to some products, foods and even things they cannot control like the weather. For those with this type of skin, Theraderm Gentle Facial Moisturizer provides just enough moisture without clogging pores or irritation. With so many different skin types and skin needs, you can see why having a consistent, quality skin care routine is so important. Theraderm Clinical Skin Care strives to produce high-quality products that helps return skin to its normal, healthy state. Angela - *Results may vary from person to person. "I came downstairs and my husband told me I looked beautiful and my skin looked great! He was unaware of my new product. I have never used anything to enhance the aging process. Most of the time people think I'm in my 40's. I even got carded at the age of 56 with no make up on." "Loving Life" - *Results may vary from person to person. "COOLYCOO" - *Results may vary from person to person. "At my age (69) there are many wrinkles and blemishes that come with aging, but I can still have healthy looking skin. 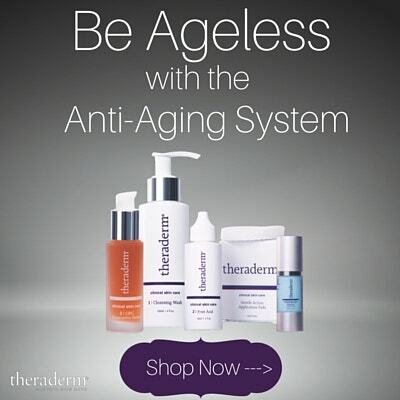 The Theraderm products help me achieve a vibrant, healthy look." Fran - *Results may vary from person to person. "I immediately noticed a difference after just one application of the OPC serum. The redness in my face has diminished. I love this product and started using all the products because I could see results!" "KKLEM" - *Results may vary from person to person. "OPC is one of my must-have products. It's a serum that you can actually tell makes a difference the second you put it on. I had a lot of redness before using this product and now I can really see a big difference in the tone of my skin from it." "SMW910" - *Results may vary from person to person. "This is the best repair cream that I have used. It normalizes my skin and takes away all the flaws. Makes my skin smooth and dewey. I get dry patches and it takes those away too. I use this instead of moisturizer. All you need is a little dab." "MERMAID1111" - *Results may vary from person to person. We believe that every person should have the opportunity to look as refreshed, young, and healthy as absolutely possible. Join the Theraderm Skin Care Club for Tips & Advice, Discounts, and more! Disclaimer: These statements have not been evaluated by the Food and Drug Administration. These products are not intended to diagnose, treat, cure or prevent any disease. The information provided on this website or any information contained on or in any product label or packaging is for informational purposes only and is not intended as a substitute for advice from your physician or other health care professional. You should not use the information on this or the product described for diagnosis or treatment of any health or skin problem or as a substitute for any prescription of any medication or other treatment. You should not use this information as self-diagnosis or for treating a skin condition. Contact your health-care provider immediately if you suspect that you have a medical problem. We recommend that you do not solely rely on the information presented and that you always read labels, warnings and directions before using a product. Theraderm.net assumes no liability for inaccuracies or misstatements about products. Copyright © 2019 Theraderm and Therapon Skin Health, Inc. All rights reserved. Enter your email address to receive your discount code. We value your privacy. Your information is kept confidential. We never sell customer information to third parties. You will also receive an email with this code.